Chocolate. Custard. Cake. Three of my favorite things all wrapped in one delicious dessert. Each part is simple and enjoyable on it’s own, but together the parts form a perfect whole. For the October Daring Bakers challenge, Mary of Alpineberry chose this dessert that she enjoys at Scala’s Bistro in San Francisco but had never made herself. I was excited to start the challenge, and I was especially excited to use my very first vanilla bean. Back in May, Tara of Seven Spoons hosted Sugar High Friday and chose the theme Neutral Territory: Tasting the Many Shades of White. One of the desserts that caught my eye was a simple French Vanilla Ice Cream presented by Cindy of Food Migration. She had used the recipe from The Perfect Scoop, and in her post she mentioned that they were awash in vanilla beans. How can a mere mortal living in North America be awash in costly vanilla beans? Cindy broke her silence and revealed her source, setting me off on a mission to find vanilla beans in a price range that I could afford. A few months later, I spent some of my fun money and ordered some Tahitian vanilla beans (Vanilla tahitiensis). The main species for harvesting vanilla, Vanilla planifolia, is native to Mexico, though it is grown throughout the tropics and Madagascar is now the largest producer. This is one item I cannot grow in my Northern Virginia garden! I’m not totally convinced that there is enough difference in flavor between Grade A and Grade B beans that I or any other home cook should shell out a substantial amount of money for Grade A beans, although beans from different regions do have subtle differences due to the amount of vanillin present in each species. I’m pretty happy with the Tahitian beans, though I think next time I’ll spring for some Madagascar or Mexican beans for a little taste test. For the Bostini challenge, the recipe calls for half a vanilla bean in the custard and orange juice and zest in the cake. We were allowed a few options for modifications, and I chose to do two of them: halve the recipe and substitute for the orange flavor because the chocolate-orange combination is not a favorite in our house. I chose to use milk, almond extract, and the remaining vanilla bean in my cake instead of the orange juice and zest. As for halving the recipe, some of the amounts did not halve easily, so I spent a fair amount of time checking and double checking amounts with a calculator just to be sure I had it right. The recipe I have written here reflects what I did this time and what I will do next time, but you can find the full original recipe at Alpineberry. As for my experience, the custard went amazingly well. I stayed on top of it the whole time and it set up just right. The straining step helped eliminate the few lumps in the mixture and it set up nice and creamy, not like a flan, but more like a pastry cream. I tried to mold the shape, but it really doesn’t work that way, so the next time I will just put all of the custard into a single bowl in the frig and then scoop out servings when plating the dessert. While dealing with the cake issue, I got distracted from the other task I had going—the chocolate. I had made the glaze a little earlier and needed to rewarm it. Yeah, I burned it! It turned black and seized up, so that pan of chocolate went into the garbage and I started over. Good thing I had extra chocolate on hand! I made a half recipe, but it almost wasn’t quite enough for all eight desserts, at least not for us, so I made some extra chocolate glaze with some bittersweet chocolate I had on hand. The bittersweet chocolate was very rich, and coupled with that custard…oh my! I would definitely make this again, though hopefully with fewer mishaps, and my neighborhood taste testers all agreed that the custard was the best part. My next door neighbor is a born and bred New Englander and lover of traditional Boston Cream Pie, and he made a point of letting me know that his birthday is in April but I don’t have to wait that long to make him another Bostini Cream Pie. So I count this challenge a success! The Daring Bakers have grown substantially this year, boasting about 200 members now, and you can find links to all the blogs and beautiful Bostini Cream Pies at The Daring Bakers’ Blogroll. 1. 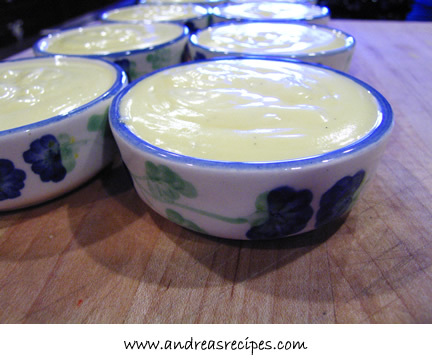 CUSTARD: Stir together milk and cornstarch in a medium bowl until smooth. Whisk in the whole egg and yolks until the mixture is smooth. 2. In the saucepan, stir together cream, sugar, and vanilla bean and slowly bring to a boil. When it reaches the boiling point with just a few bubbles on the surface, add a ladle of the hot cream mixture to the egg mixture and whisk to temper the eggs. Stir the tempered eggs into the cream mixture. Cook, stirring constantly, until the mixture thickens enough to coat the back of a spoon. Stay with it! Don’t be tempted to wander off or try to multi task on this one, because it can bubble up and boil over in a second. Strain the custard to remove the vanilla pod and any lumps, then pour into small bowl. Chill in the refrigerator and keep chilled until read to serve. 3. CAKES: Preheat the oven to 325° F.
4. In the large bowl, add the cake flour, sugar, baking powder, and salt. Add the oil, egg yolks, milk, vanilla seeds, and almond extract. Stir mixture until smooth, but do not over mix it. 5. In the bowl of the stand mixer, beat the egg whites until frothy. Add the cream of tartar and continue beating on high until soft peaks form. Add the beaten whites to the cake mixture and fold in gently. 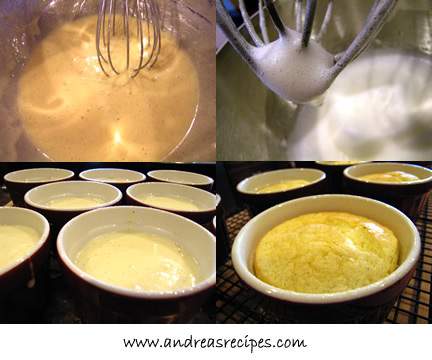 Pour into the sprayed custard cups. 6. Bake for about 25 minutes, until the cake bounces back lightly when you press it with your finger. Remove from the oven and allow to cool on a wire rack. Once the cakes are completely cool, then remove them from the cups. Cover with plastic wrap to maintain moisture and set aside until ready to serve. 7. GLAZE: Melt the unsalted butter in a small saucepan over low heat. Remove from heat and stir in the chopped chocolate until it is fully melted. Strain if necessary and keep warm. 8. ASSEMBLE: Wait until you are ready to serve dessert before assembling, otherwise the cake will get a little stiff and the chocolate will firm up. Pour the custard into bowl or onto a plate. If necessary, level each cake with a serrated knife. 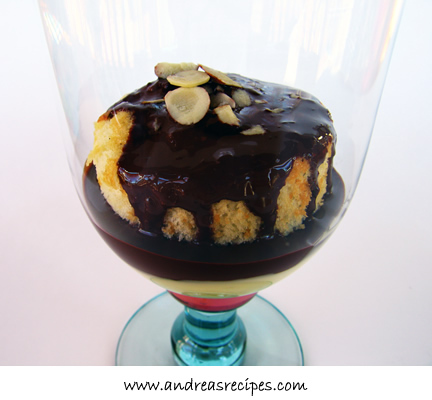 Lay a cake on top of each pool of custard, then drizzle the chocolate glaze over top. Garnish with toasted sliced almonds if desired. Serve immediately. I love the glass you put the bostini in – it’s so colorful! And yes, vanilla beans are the best, aren’t they? Yummmm. Chocolate and almond is one of my favorites. Well good for you for perservering inspite of the mishaps. Great job! My goodness Andrea, so that’s how mine were supposed to look! They’re great! Well done. Snazzy Bostinis you’ve got there, Andrea! I love that glass! I’m sorry about the chocolate.. I’ve been there – often. There’s nothing quite like the smell of burned chocolate, eh? Ugh. Anyhoo.. they turned out beautful in the end! Gorgeous, Andrea! I can see those little flecks of orange zest, which is just so pretty. 🙂 And your photos are really good. I’m sorry that your first batch of chocolate glaze burned…its so easy for it to ctach, isn’t it? Particularly when you are doing several things at once…in spite of an mishaps along the way though, your Bostinis sure did end up looking perfect! Andrea, I’m so glad I can access your blog now! Your bostinis look great no matter the mishaps and it sounds like your taste testers loved it enough to request more 🙂 Great job. As for the chiffon cake, I see it as a sign of improvement if your cake didn’t separate as much as the previous time. Extrapolating says the next time it will be perfect! Someday I will try something with a real vanilla bean…until then I must stick with extract. Looks great. I couldn’t access your blog earlier…beautiful Bostini’s you have there! They are gorgeous, look very tasty! I’m going to have to buy some vanilla beans soon! I only used some old ones a long time ago but I can’t remember how it tasted compared to extract. I agree this was a pretty good custard recipe, though next time I probably will substitute half and half or just all whole milk in place of the heavy whipping cream. But it was good, very smooth and just the right texture. Thanks for the welcome, I really enjoyed my first month with you all! Andrea, your picture layout is just beautiful! WoW! Vanilla bean makes a huge diference! I was able to use some too ( I snuck some in my suitcase when I came back from France this summer). They are hard to find a lot of the time! 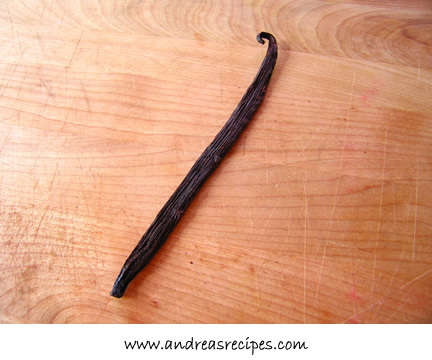 You’re so lucky–Tahitian vanilla beans are almost legendary in my mind! I’ve only had the pleasure of using and tasting them once, and it was unforgettable. I also love your almond substitution. I’m loony for almonds, and I was giddy when I saw the sliced almonds on top of your lovely dessert. I’m glad it all came together well at the end! I bet that combination was really good – glad you enjoyed the challenge! Thanks for the info on vanilla beans. Your Bostinis look great and I’m glad your neighbor from New England gave it the thumbs up. I guess it must be somewhat authentic. If not, it’s still delicious. As always, you come up with something very lovely… The glasses you used is truly special – such color effects are wonderful. How did you get the smell of burnt chocolate out of your house? Btw, I love the bowls you used for the custard, very pretty! Very nice looking cakes! Sorry about the chocolate burn; I’m (unfortunately) acquainted with that smell! Mmmm, I love the almond + chocolate + vanilla combo. Yikes about the chocolate burning! Although I love chocolate/orange, the almond-flavored cake sounds wonderful too. Thanks for the link to the vanilla source! Great phot of a beautiful Bostini! I just started using vanilla beans not long ago, and I am now addicted!! I do have to save them for special occasions, though. Your Bostini looks great, and I love the idea of an almond/vanilla cake! Andrea, your bostinis looks wonderful! I love the glass you used for the presentation! I love the photo props too, and I’m glad you dared to try a vanilla bean! Your Bostoni look gorgeous! Great job, wow! Andrea, I always love coming to your blog and learning something about an ingredient or a dish I didn’t know. Great tutorial on vanilla (and hey, if we can’t spend our pin money on something fun like real vanilla beans then what fun can there be??!!) Great job on this challenge this month and glad to be baking with you!! I love the ratio of chocolate to everything else 🙂 Great thinking! Now I MUST order some vanilla bean from Penzey’s. This is such an informative post as well as having a beautiful photo of the Bostini. Your finished bostini looks great, and you would have no idea about any rubbery mass originally part of the cake. Hope the sugar-up-the-nose incident was, if not enjoyable, not the worst cooking ingredient that could attack you (such as chilis or peppers). what a beautiful glass to serve your bostini’s in! i have to find a good (and cheap) supplier of vanilla beans over here, i have foujd plenty of OK beans but nothing spectacular. since i use quite a bit, i want to source the best… another life-long project, i guess! Great job and thanks for the vanilla supplier. I’ve been looking for a place that I could trust for some time. Great bostinis, love your blue glass and ramekins too! Despite your mishaps, you did a very fine job! THe Bostinis look so god in the oversized glass! You did a great job! This challenge definitely had a lot of my favorite things. What a great idea, to substitute the orange with almond. Your neighbours are very lucky people indeed. I say this was a huge success Andrea: you learned a lot, the cake got better and the neighbor likes it. Oh, I love your Bostini Creme Pie! Thanks for stopping by my blog with your kind words. This dish it is in is gorgeous! Great presentation! Your custard looks wonderful. Well done!